After years of assisting the political career of her husband, Ralph Church, and working for various charities, Marguerite Stitt Church won election to the House of Representatives to succeed Congressman Church after his death in 1950. Congresswoman Church sought and gained a seat on the Foreign Affairs Committee, traveling to more than 40 countries and seeing firsthand how U.S. foreign aid was employed in them. 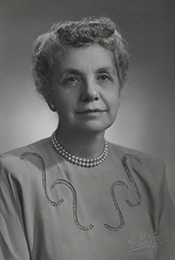 Church left Government Operations in the 84th Congress (1955–1957) to focus exclusively on her Foreign Affairs Committee assignment (which she had received two years earlier). After winning re–election in 1952, she had been offered a spot on the prestigious Appropriations Committee, where her husband once sat and, in fact, where only one woman had previously served. The committee chairman made the offer, but Church declined. “I’m awfully sorry,” she replied. “I’ve spent all summer trying to persuade people that it would be a loss to the country if they didn’t put me on the Foreign Affairs Committee. That has become my major interest.” She later claimed that she did not want to accept an assignment that, she believed, was made partly as a tribute to her husband.13 She served on Foreign Affairs until she retired from Congress. In 1962, as an advocate of mandatory retirement for Members of Congress and facing reapportionment in her district, Church set her own example by retiring at age 70 after the close of the 87th Congress (1961–1963) in January 1963. She worked on behalf of the Republican presidential campaigns of Barry Goldwater in 1964 and Richard M. Nixon in 1968. She later served on the boards of directors for the Girl Scouts of America and the U.S. Capitol Historical Society. In 1971, President Nixon selected Church to serve on the planning board for the White House Conference on Aging. Marguerite Church resided in Evanston, Illinois, where she died on May 26, 1990. 1Marguerite Stitt Church, Oral History Interview, 25 November 1978, U.S. Association of Former Members of Congress (hereinafter USAFMOC), Manuscript Room, Library of Congress, Washington, D.C.: 16. 2Kerry Luft, “Marguerite Stitt Church, Ex–Congresswoman,” 27 May 1990, Chicago Tribune: 8. 3Genevieve Reynolds, “Charming Mrs. Ralph Church, A Model of Cultured Intellect,” 13 February 1949, Washington Post: S8; Marie McNair, “Mrs. Church Dons New Role,” 21 January 1951, Washington Post: S1; Church, Oral History Interview, USAFMOC: 1; 23. 4“Rep. Church Dies Testifying in Committee,” 22 March 1950 Washington Post: 1. 6Church, Oral History Interview, USAFMOC: 5. 9“Politics Won’t Sway Him, Economic Chief Asserts,” 15 July 1953, New York Times: 13; “No Politics in His Advice, Chief Economic Aide Says,” 15 July 1953, Wall Street Journal: 20. 10Hope Chamberlin, A Minority of Members: Women in the U.S. Congress (New York: Praeger, 1973): 221–222; Karen Foerstel, Biographical Dictionary of Congressional Women (Westport, CT: Greenwood Press, 1999): 59; Congress and the Nation, 1945–1964, Vol. 1–B (Washington, D.C.: Congressional Quarterly Press, 1965), 1466. 11Church, Oral History Interview, USAFMOC: 28–30. 13Church, Oral History Interview, USAFMOC: 9. 15ane Eads, “Congresswoman Church Back From Far East,” 31 January 1954, Washington Post: S3. 16Joan Cook, “Marguerite Church, Ex–Congresswoman, Dies at the Age of 97,” 30 May 1990, New York Times: B20. 17Church, Oral History Interview, USAFMOC: 13–14. 18Catherine Dean May, Oral History Interview, 20 April 1979, USAFMOC, Manuscript Room, Library of Congress, Washington, D.C.: 216–217. 19Congressional Record, House, 87th Cong., 1st sess. (14 September 1961): 19502–19504; 19535–19536. Papers: 1919-1981, 2.5 linear feet. The collection contains personal and political papers. Documents include programs and announcements of official events, press clippings and releases, speeches, and a book relating to a special political committee (1961). The papers also consist of letters of congratulations from Members of the House of Representatives to Marguerite Church on her retirement from office in 1962, scrapbooks of newspaper clippings relating to her husband Ralph Church's political career (1934, 1938, and 1940), and material relating to Ralph Church's death. Papers: In the Sterling Morton Papers, 1885-1961, 33 items. Correspondents include Marguerite Church. A finding aid for the papers is available in the repository. Papers: In the Pluma Burroughs Penton Batten Papers, ca. 1948-1964, 5.25 linear feet. Subjects covered include Marguerite Stitt. "Marguerite Stitt Church" in Women in Congress, 1917-2006. Prepared under the direction of the Committee on House Administration by the Office of History & Preservation, U.S. House of Representatives. Washington: Government Printing Office, 2006.